It is with great pleasure that the Disability History Association announces that Paul Longmore, the father of our field, has received Honorable Mention for the 2016 Publication Award. Thanks to Cathy Kudlick and a dedicated group of disability scholars for working on bringing this book to publication and for making sure that Paul’s legacy, scholarship and impact upon our field and its genesis, lives on. 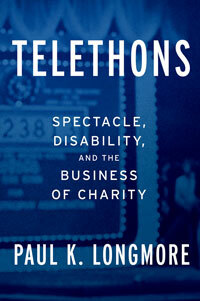 Book cover of Paul Longmore's book "Telethons"
Congratulations and deep felt gratitude to Paul for his monumental contributions to our field. Click here to read more about Telethons on our blog!